The following section will cover how to enable sending your Linux syslogs to Retrace to be viewed in the Logs Dashboard with an agent running on your server. To enable syslog on your server, go to the server settings of the server and check the Syslog checkbox. By enabling this setting, an **rsyslog.conf **file will be created in the /etc/ directory. You can edit this file for some additional configurations around your syslogs. Rsyslog will now forward all the messages to UDP port 10514. 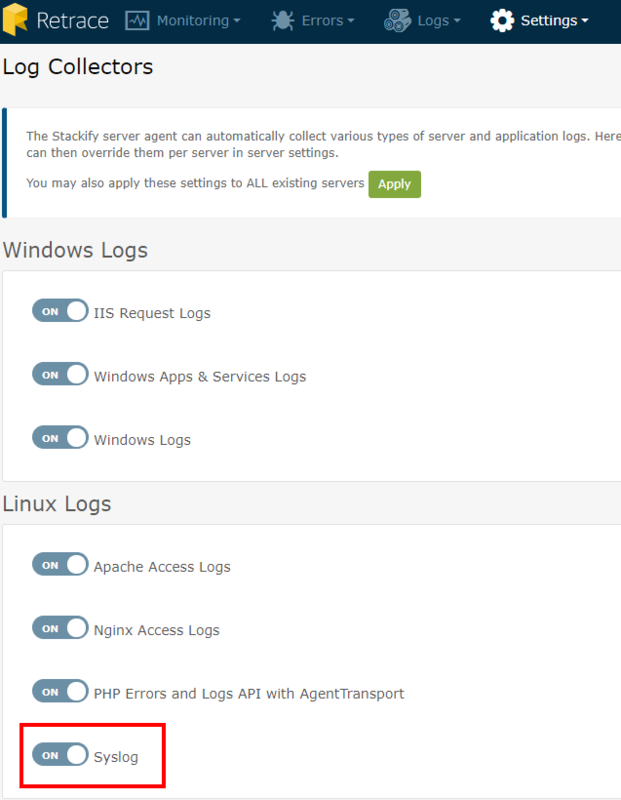 The Stackify Agent will create a listener on the specified port and process incoming messages. You can use any port number greater than 1024 to bind to the Stackify agent. Note: The port cannot not be used by any other application. Stackify Agent does not have established permissions for listening on privileged ports, which is why the port number must be greater than 1024. Use your IP address instead of a hostname in the rsyslog.conf. file. You can enable syslogs per server in the server settings as mentioned earlier, or you can enable it globally for all new and existing servers in the Log Collectors page. By turning on the Syslog settings, all new servers that you install will have syslog enabled by default. By clicking on APPLY at the top of the page will enable the setting on all existing servers. See this doc for more information.